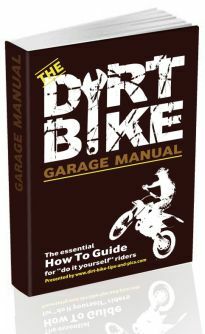 I have driven myself crazy trying to find the perfect system for transporting and securing my dirt bikes without it being a huge pain. Originally, I started by just loading them into the back of my truck. I found that to be cumbersome, and eventually, we had too many bikes to fit in the back. A 6×12′ enclosed trailer with a ramp on the back. This allows me to fit 5 full-size adult dirt bikes. I love the enclosed trailer because then I don’t have to unload when I get home. The bikes just stay in there. These amazing wheel chocks (available on Amazon.com) that do a great job of securing the bikes. 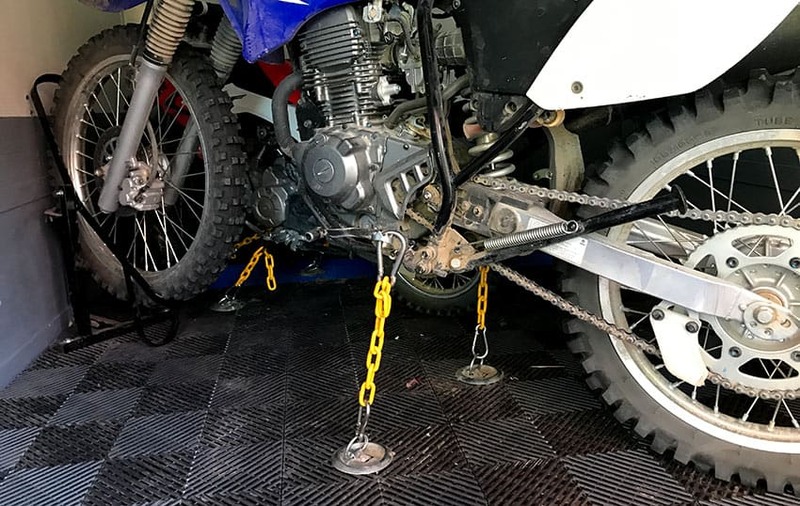 A strapless chain-to-footpeg system for EXTRA security and being certain the bikes NEVER move in the trailer. Most people just use the wheel chocks alone, but I’m a belt-and-suspenders kind of guy. That’s my setup and I’m really happy with it, but I’ll give you a list of the products I liked best for transporting in just a truck, as well as what I use now in my trailer. Either way can work fine, so just go with whatever makes the most sense to you. If you don’t have an enclosed trailer and you’ll just be securing the dirt bikes in the back of a truck, then your setup is pretty simple. You’ll just need a ramp and some straps. The ramp that I recommend is available on Amazon and it’s called the Yaheetech motorcycle loading ramp. I made the mistake of buying some CRAPPY cheap loading ramps initially and it was not only a pain, it was actually quite dangerous. I like this ramp better because it’s much wider and longer, so the bikes come at less of a steep angle and there is more forgiveness for the tires being a little off to the side as you drive it up. Get a good ramp and you’ll be glad you did. Next is the straps. I personally like using the ratcheting type of strap instead of the traditional slide-to-lock straps that most dirt bike companies offer. I have just seen too many times where the slide-to-lock style straps did NOT secure the bike sufficiently, they slipped a bit, and the bike fell over or came loose and hit some of the other bikes. The straps I like are these ones on Amazon. The trouble with securing your bike with straps is that the rubberized metal clips on the end tend to scratch up the handlebars. You can fix that buy getting these tie-down loops to attach around your handlebars and then the straps attach to them. It saves your handlebars from getting all messed up over time. I spent weeks doing research before buying a trailer. I wanted one short enough to fit in a garage bay, and just big enough to easily fit in my 5 dirt bikes and all of our gear. I also didn’t want to waste money. 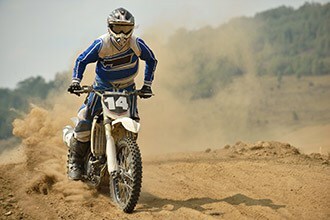 So if you’re buying a trailer specifically for dirt bikes, check out this post where I go through points to consider. That post will show everything you need to look into. As I mentioned in the introduction, a good dirt bike trailer is really nice to have. I love that I can load up my dirt bikes in the trailer in under 30 seconds per bike, drive home, and park the trailer beside my house and I don’t have to unload the bikes. This really cuts down how much time it takes me to get out and ride, and to get home. If it’s easy and fast for me to do this, then I find that I take the family out dirt biking much more often. A good enclosed trailer has been the BEST investment in dirt bikes for our family! To check out my dirt bike trailer in full detail, read this post on building the ultimate dirt bike trailer. First, you need to look at a trailer and pick one. For some tips on what to look for in a trailer, read this. If you’re not sure what size trailer to get, then read this post to see what size of trailer fits the number of dirt bikes you have. I chose a 6×12 trailer so that it’ll fit 5 full-size dirt bikes. Next, you need to decide how to secure the dirt bikes in the trailer. The system I use is to have the amazing wheel chocks from Amazon.com I mentioned at the start of this article to secure the front tire of all of the bikes. Then, I have a strapless tie-down system. I really really like this system just to give me some extra security. The combo of the wheel chocks and the stapless chain-to-footpeg system basically makes it IMPOSSIBLE for my bikes to fall over or get damaged while in transport. It also means that the forks are never compressed while I transport my bikes, which is really nice for not messing up the fork seals. The chain system basically means you put a D-ring on the bottom of your trailer and attach a short length of chain to it with a carabiner. Then clip another carabiner to the top of the chain and attach that to your footpegs on either side. It’s really fast to attach in under 30 seconds and makes the bike way more secure. I also did some fun things in my trailer like putting down flooring tiles on the ground to make it look nice, and also painting all of the walls with textured deck paint to prevent the wood from rotting and to make it look nice.